Some see a weed. Some see a wish. Some see a mission. Ok, maybe I am the only one who can see a mission in a dandelion! 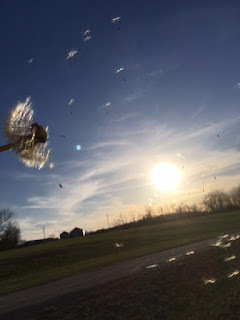 This new perspective came one day as I was trying to capture, with my phone camera, dandelion seeds as they were in mid flight. You know, the perfect picture of the fuzzy parachute like seeds gently floating by? I thought It would by pretty easy, right? After all, others have obviously mastered this art. Lets just say, I tried for thirty to forty minutes and never quite got a “Pinterest worthy” picture. I tried all sorts of methods. I tried blowing the dandelion, my little sister tried blowing it, we tried waving it, even lying on the ground and looking up as my sister blew the seeds down didn't work. We tried taking lots of pictures in a row and even then nothing seemed focus on the seeds, or we would just miss them all together! I did get lots of good pictures, but none of them were what I thought I could capture. Seriously, has anyone ever tried to take a picture of a dandelion blowing away? If you have any tips, I’d love to know how it is done! My creative brain kicked in with one of the pictures (top picture.) I was able to angle my camera to make the seeds look like a small heart which was really cool! In this same picture, one seed’s fuzz was stuck to the dandelion and hung there. It was holding on and wasn't letting go to be carried away into the unknown. As soon as it let go, it could be planted to grow more dandelions. Wait a minute! Now my writers brain was spinning way out of control. The dandelion seed was holding on. It wasn’t letting the wind carry it away. It was waiting and doubting, scared of the unknown. It was given a job to spread the seed, planting it. It’s only mission was to plant the seed. It didn’t need to water it or give it light, that was natures job to grow it. All it had to do was let go and be carried. Do we ever try and find excuses for not letting go? Are we letting our fears and doubts hold us into place, keeping us from being carried? Are we scared of the unknown? Are we uncertain of where we are going? Of what our mission is? Each and every one of us is given a special mission. One that God has perfectly planned for us. Some might know what their mission is, but if you are anything like me, then you don’t know quite what God has in store for you yet. I do know that God wants all of us to spread the Word, to be a witness to others, and to be a example by living like Him. Whether it be speaking in front or hundreds of people, or talking to a friend. Whether it be participating at church, or a simple act of kindness to your neighbor. Whether it be traveling to other countries as a missionary, or finding your own mission field close to home. Each of us has our own special mission. Our own calling that God has put on our hearts. We are all given talents that God wants us to use for His glory. So, like the dandelion seed, sometimes we hold on too long. Sometimes we won't let God carry us away into the unknown. We are unsure, waiting and doubting. We were given a job to spread the love of Jesus, to share the truth. All we have to do is plant the seed. God does the rest, making that seed grow. All we have to do is let go and be carried. What is holding us back? Have you ever tried to photograph dandelion seeds blowing away? What is your favorite picture that I took? Do you know what your special mission is? Or is God wanting you to trust Him and let Him carry you? What are some ways that we can step out of our comfort zones and let go of our fears, so we can witness for Him? Personally, I kinda like the last one. Like how the background is in focus, and the dandelion and seeds are blurry. Haha! Yes, well good luck if you decide to photograph dandelion seeds in flight! They are hard little things to capture:-). Thanks for commenting, have a great day!!! Great post! And I love the way you related the dandelion to us! Sometimes we don’t want to let go, it’s hard to let go and we’re afraid we may fall. I read a quote somewhere that said something like ‘sometimes God catches us when we fall, other times He teaches us how to fly’ - but before that can happen we need to let go. God has a plan for each of our lives ... and as you said, we don’t all know what that is yet (*cough* me *cough*). But we should let go of our fear of the unknown and go where He leads us. Sometimes it is very hard to let go and trust. The unknown is scary. I like that quote! Your right, God can only carry us if we let go and let Him. Where I'm at right now, I don't know what my special mission entails, yet. And that is ok. Its ok not to know, because God wants us to trust. Wow, well said! I really needed this reminder. :) And I love dandelions, so....excellent analogy! Thank you, Faith! I like dandelions too! They are really pretty and can be very bold. As Christians, we should have this same perseverance in planting seeds for Jesus! Hi Natalie! Thanks for visiting my blog! Dandelions make great pictures, but the moving ones are definitely harder to focus! :) Thank you! I like that last one too. And your pictures are beautiful!